The oil giant has agreed a $20.8bn settlement with the US government. Five years after the Deepwater Horizon spill, the dark, oily sheen swirling around BP may finally be starting to clear. The US justice department announced the oil giant was finally getting ‘the punishment it deserves’ – fines totalling $20.8bn (£13.7bn), the largest settlement with a single entity in its history. It comes three months after BP announced it would be paying $18.7bn to the US federal government and five states, but what’s a couple of billion between friends? At the time, it said the settlement would add $10bn to the $43.8bn it had already set aside to cover the April 2010 disaster, in which 11 people died and more than 3 million barrels of oil spilled into the Gulf of Mexico over a three-month period. You might not think there is any reason to be cheery about a multi-billion dollar payout, but for BP this finally brings the prospect of closure to an incident from which its share price still hasn’t recovered. 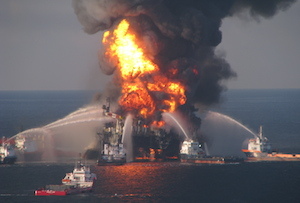 BP has said it will be paying this mega-settlement for another 17 years. It’s also still got hundreds of small civil claims lodged against it, which it has said it will contest ‘vigorously’. Financially, the oilrig explosion will continue to be an albatross - and a salutory warning for VW on just how long, damaging and expensive tangling with the US authorities can be. But shareholders appreciate the relative certainty this settlement will bring (although they knew about the majority of it before, so shares only rose slightly behind rival Shell’s yesterday afternoon and today). And the prospect of fewer disaster-related headlines should speed up the process of cleaning up its oil-slicked reputation.